Can Uzbekistan Become a Model Secular, Muslim-Majority State? Uzbekistan’s efforts to expand religious freedoms in the country have not gone unnoticed, but challenges remain. On December 11, for the first time since 2006, Uzbekistan was not designated by the U.S. State Department as a Country of Particular Concern (CPC) for restrictions on religious freedom. The decision to remove Uzbekistan, according to U.S. Ambassador at Large for International Religious Freedom Sam Brownback, was a recognition of “substantial changes” made by the country. In practical terms, the effects of the removal of Uzbekistan from the CPC list are important but not necessarily concrete. Uzbekistan, since its first appearance on the list in 2006, had always received a national security waiver removing the threat of sanctions tied to its appearance on the CPC list. Nevertheless, its appearance on the list impacted its standing on various ranking indexes and its reputation, having indirect impacts on areas like trade, international investment, and tourism. At the same time, difficulties remain. While Uzbekistan was removed from the main CPC list, the country was kept on a watch list — indicating that while Tashkent has made progress, the road to addressing religious freedom violations in the country is long and backsliding possible. 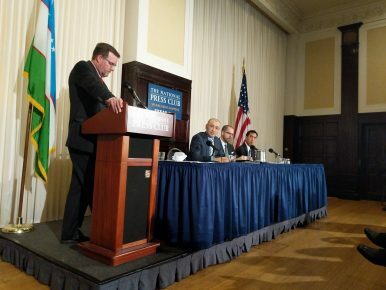 Speaking at an event held at the National Press Club in Washington, D.C., to mark Uzbekistan’s progress in the realm of religious freedoms, Uzbek Ambassador to the United States Javlon Vakhabov brought up the matter of a raid on a Baptist church in Tashkent that occured in late November. Vakhabov also stated that Uzbekistan has committed to preventing raids on unregistered religious organizations as well as simplifying registration procedures. Uzbekistan’s active engagement in the realm of religious freedoms under President Shavkat Mirziyoyev since late 2016 has sparked an unprecedented level of open discussion. For example, in October 2017 the UN Special Rapporteur on Freedom of Religion or Belief, Ahmed Shaheed, was invited to visit Uzbekistan — the first special rapporteur to do so since 2002. In June 2018, the Uzbek Parliament approved a roadmap to implement the UN’s recommendations and a new law on religions is expected in early 2019. Knox Thames, U.S. State Department Special Advisor for Religious Minorities in the Near East and South/Central Asia, also speaking at the National Press Club, said that the actions which the U.S. has taken note of include the releasing of over 1,000 prisoners held for their religious beliefs, delisting of thousands more from government extremist blacklists, the registration of 13 Muslim religious organizations and the first Christian church in over a decade, and the loosening of restrictions on worship. With regard to Uzbekistan’s roadmap, Thames said it details a “whole of government approach to reform” to ensure Uzbekistan adheres to international human rights obligations and commitments and to ensure individual religious freedom. The roadmap, Thames noted, built directly from the UN’s recommendations. “I can honestly say I have never seen a country respond in such a tangible way by creating a process to enshrine UN recommendations into domestic law,” Thames said. On the question of reviewing individuals imprisoned on religious charges under the previous regime, Thames spoke of an Uzbek government receptive to questions on specific cases and actively working to address the issue. “The general sense was that the numbers [of people jailed on religious charges] are coming down, the government is reviewing and acting on those cases where… there has been excessive criminalization.” Thames said that the U.S. has encouraged the Uzbek government to begin a formal review process of remaining cases. “Step by step, as education and training changes mindsets, mindsets change behavior,” Chris Seiple, president emeritus of the Institute for Global Engagement (IGE), clarified. Uzbekistan sees itself as establishing a model for a secular, Muslim-majority state. This “new Uzbekistan” Vakhabov noted in his opening remarks, was seeking to openly tackle a “backlog of challenges,” first by eliminating past practices and second by enhancing the level of protection of civil rights, particularly freedom of religion. Progress is noticeable, but challenges remain. Not only are occasional police raids of unregistered religious groups troubling, but the balance between a secular state and an increasingly pious religious population is not so simple to strike.